Even though industrialization and processed foods have invaded the country, including small towns, we still cherish the taste of the snacks, candies, and desserts that are made using fruits or grains. It will be very sad to lose those candied sweet potatoes, pumpkins, pineapples, figs, coconut-stuffed lemons or the nut pralines, just to name a few. I hope the new generations embrace natural products instead of all the processed options out there. One of the most popular sweet desserts we have in our Mexican culture is the “Arroz con leche”, which, as with the other candies or desserts I mentioned above, is all natural, easy to make and very delicious. Let me start off by saying that this is not the old-fashioned way of making Rice Pudding. This, of course, will depend on your age, since condensed milk has been around in México since before the 50’s. I also have to say that this is the way I remember it being cooked, and it is the easy way. My mom would boil rice with water and then add the condensed milk, without even thinking twice about the other ways of making it. It could be that having eight children didn’t give her much time for long cooking processes. So when somebody wrote me asking for the recipe, I felt a little embarrassed to let them know that I use a shortcut with this easier method and not the old-fashioned way that uses just plain whole milk and sugar with a long-simmering process until it’s all reduced to a creamy texture. The bright side of using this method is that your rice pudding will be ready in half the time. Below is a picture of some of the candied fruit one can find here in the States at the Latin Market. I encourage you to try them if you have the chance. In this picture Mexican Fruit Candied: Pumpkin, Pineapple, Figs, Sweet Potato and Visnaga (Curcubita Ficifolia). While the rice is cooking, mix the whole milk with the condensed milk and stir well. The rice will be ready when all the water has evaporated and it has formed some holes over the surface like in the above picture. Remove pot from heat. Pour the whole milk and condensed milk mix into the saucepan and stir. If you would like to add the raisins or vanilla extract, you can add them now. Return saucepan to heat, cover and keep cooking until it thickens. It will take about 5 to 10 minutes. Stir occasionally to avoid it from sticking to the bottom of the saucepan. If the rice looks too dry for your taste, add 1/4 cup of warm whole milk and stir. The end result has to look like a soft and creamy pudding. If serving warm, place in small cups and sprinkle ground cinnamon. When serving cold, pour rice pudding into a container and cover with a plastic wrap pressed down to the rice surface and refrigerate. Dust with cinnamon when serving. 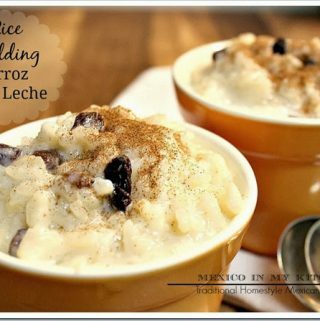 One of the most popular sweet desserts we have in our Mexican culture is the Mexican Rice Pudding “Arroz con leche”, which, as with the other candies or desserts I mentioned above, is all natural, easy to make and very delicious. I hope you enjoy this delicious recipe. Place water, rice and the piece of cinnamon in a medium saucepan. Turn heat to high and bring to a boil, then reduce heat and simmer uncovered for about 20 minutes, until rice is tender. * Short rice has a higher starch content, which will render a creamier rice pudding, but you can use medium or long grain rice as well. ** Skim milk or 2 % can also be used here; if you want a creamier consistency then a little more milk will be needed in the final cooking stage. The sweetness of the condensed milk will be enough for some, but if you have a very sweet tooth go ahead and drizzle in some more. Other flavorings like a teaspoon of vanilla, lemon or orange rind, or even the leaves of orange trees are all good additions. Oh my do I love arroz con leche and I make it this way too. Now I'm tempted. Thanks Mely. Happy New Year. I am glad to know you like it. And Happy Birthday to you my friend. Mely no había visto tu receta de arroz con leche. Es uno de los postres que me gustan más. Se ve muy rico y cremoso, se me antojó! MMM que rico! "Arroz con leche, me quiero casar, con una ….." no me recuerdo el resto de las palabras! …con una señorita de San Nicolas! Que sepa coser, que sepa bordar. ¡Que sepa abrir la puerta para ir a jugar! Just made this for breakfast. It reminded me of mama's house! Delicious!!! Thanks for posting! WOW, Just made this right now and it was amazing… my husband was so happy… I've already tried 3 of your recipes and they have all been amazing, thank you. I'm so glad your husband is happy with your cooking. Thank you for trying the recipes. Made this for my husband a few days ago and now I'm making it again, he can't get enough!! I was wondering how much your serving size is (1 cup, 1/2 cup, etc.) I am going to make this for a school potluck and just wanted to know so I can make enough. thank you. thank you. I tested it out before and omg it is great I love arroz con leche, especially this recipe. Thank you for this recipe. I have been looking for something that might be close to Mom's arroz con leche and I think yours is it! Can't wait to try it. Thanks, again!!! 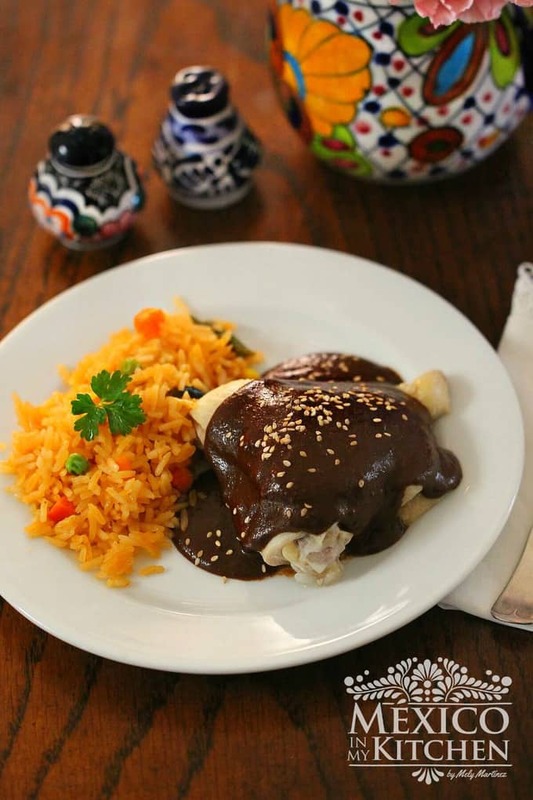 This and your recipe for molletes dulces takes me right back to my ‘Lita’s cooking!!!! She was a professional chef from Oaxaca, Mexico. She came here to the U.S. in 1946, married my abuelito, and had a family while co-owning, and cooking at, a cantina. She spoiled us all to death with her food!!!! You can try this simple and easy recipe, I’m sure everyone will love it. Thank you for your comment and the nice tips about the raisins. A shorter grain of rice has more starch, hence creamier rice pudding. When you say, can add lemon or orange peel. Do I add slice of zest of peel? A slice of the lime, lemon or orange peel about 2 inches long X 1/2 inch wide. Make sure it doesn’t have the white part only the outer skin. The white part is sour. Then remove before serving.